Listening room is modeled the general music listening environment. And as for it, an ideal listening environment of a high interception performance has been achieved. 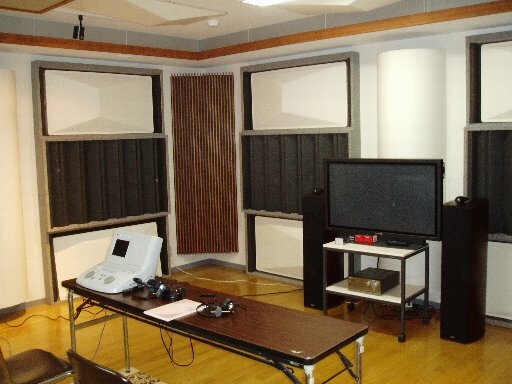 Therefore, unlike the anechoic room it is designed as there is a reverberation. The one that looks like a black curtain in figure below is the sound absorber, and is attached or removed. The reverberation time can be changed by its attaching and removing. The experiment that uses the sound and the image and the evaluation experiment of sound quality mainly made here.